Tokidoki (the Japanese word for sometimes) is a lifestyle brand that launched in 2005. Amongst its catalogue are clothes, shoes, art, cartoon characters and now an online slot. Powered by IGT, it’s a 5 reel 40 payline game that comes with a range of extras including random, expanding and matching wilds, payline multipliers of up to 15x and total bet multipliers of 10x. 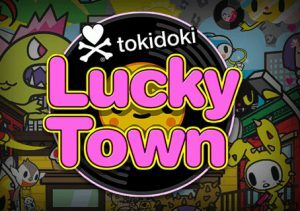 The brand’s heart and crossbone logo and Japanese-inspired characters form the basis of the reels in Tokidoki Lucky Town – the town itself looks like a cartoon version of modern day Tokyo. The Tokidoki logo on a yellow backdrop is the most impressive of the base game symbols as it’s a multiplier wild. It lands on the middle reel only and doubles any payouts when it forms part of a winning combination. The Real Reveal feature is central to the action – this is triggered when the spinning record lands on reel 5. The disc then works its way to the left, moving 1 reel at a time and in the process offering a Reel Reveal. Each Reel Reveal spin comes with a special extra which varies with each reel. There are 5 in all. Revealed Reel #1: Caramella – a trio of random wilds are added and can land anywhere on the reels. Revealed Reel #2: Truffle – multipliers are applied to all of your payouts on this spin. These can boost your wins from between 2x and 15x. Revealed Reel #3: Pogo – a wild will expand and fill the 2 positions to the left. Revealed Reel #4: Carton – you’ll be presented with a selection of cartons. Pick 1 to reveal a prize of between 1 and 10 times your total stake. Revealed Reel #5: Character Wilds – a symbol upgrade is on offer here meaning all matching character symbols turn wild. If you’re used to a simple fruit machine style slots then the chances are you’ll find Tokidoki Lucky Town a little bit different – have a few goes in play mode until you get the hang of the Revealed Reel extras. Once you have got your eye in, there’s plenty to enjoy here, despite the lack of free spins. The theme won’t be to everyone’s liking but the variety of the features will keep you coming back to this highly strange taste of Japan. If you like Japanese themed offerings, NetEnt’s Koi Princess is worth trying.